For the treatment of internal parasites including roundworm, hookworm and tapeworm, in cats. Milbemycin oxime interferes with nerve transmission in invertebrates, which helps protect against heartworm, roundworm and hookworm. Praziquantel causes muscle spasm in tapeworm, which are then attacked by enzymes and disintegrate. It kills all intestinal forms of tapeworm. Milbemax is a broad spectrum intestinal wormer used in cats to treat roundworm, hookworm and tapeworms. If given monthly, it also offers prevention against heartworm. Milbemax for cats is a tiny, palatable beef-flavoured tablet that many animals will take straight from the hand. Milbemax protects against immature and adult roundworm (Toxocara cati, Toxascaris leonina),immature and adult hookworm(Ancylostoma tubaeforme) and tapeworm (Dipylidium caninum, Taenia spp). If given monthly, Milbemax protects cats against all of the above, as well as heartworm (Dirofilaria immitis). 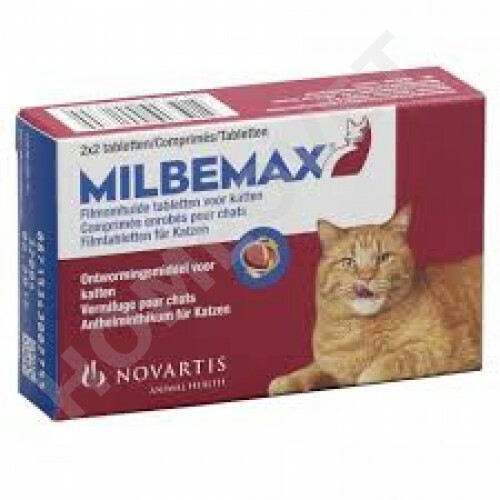 Milbemax for cats should be given to cats weighing over 2 kg every 3 months. Nursing queens should be treated at the same time as their kittens. Once a month, preferably on the same date. Mature cats should be tested for heartworm before receiving Milbemax. If a dose is missed, treat immediately and resume monthly dosing. Milbemax Cat has a satisfactory safety profile when used as per label directions. It has been tested to a minimum interval of one week between doses. Milbemax Cat has not been safety tested in kittens weighing <0.5kg or aged <6 weeks, therefore use in these groups is not recommended. Milbemax Cat can be used in breeding animals, including toms and pregnant or lactating queens. Praziquantel has demonstrated satisfactory safety margins during all reproductive phases. Cats should be tested for existing heartworm infection before starting treatment. This formulation is not suitable for use in dogs. Do not use the ‘tablets for Cats’ in cats weighing less than 2 kg. The product should not enter water courses as this may be dangerous for fish and other aquatic organisms. Milbemax can be used in breeding cats including pregnant and lactating queens. The product with the feed or administered shortly thereafter. This causes optimum protection against heartworm Erkan Kung. Depending on body weight of the cat, the practical dosing following.